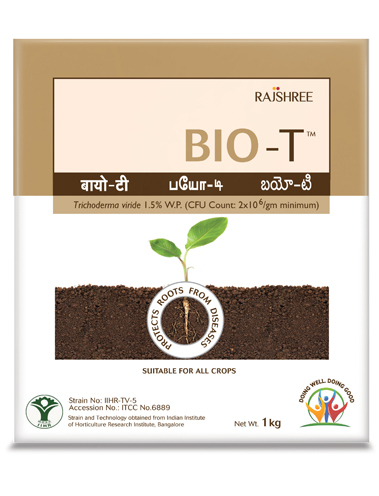 BIO-T is a talc based formulation containing the strains of Trichoderma viride. It controls soil borne plant diseases like damping off, wilt, root rot and collar rot. It grows faster than disease causing fungi, coils around the pathogen, penetrates and kills the fungus. The pathogen eventually dies and gets eliminated from the soil. 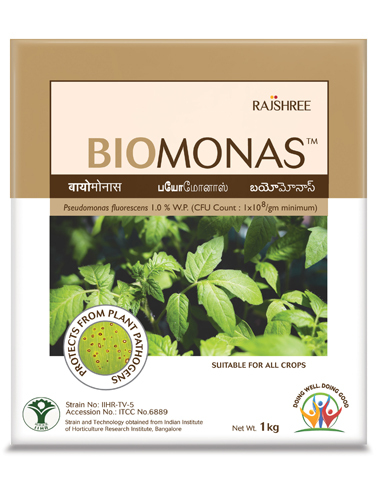 BIOMONAS is a talc based formulation of the bacterium; Pseudomonas fluorescens. It controls soil borne plant diseases like damping off, wilt & foliar diseases such as leaf spots, blights, blast in various crops. It also acts as a plant growth promoter by secreting plant growth hormones and organic acids. The pathogen eventually dies and finally gets eliminated from the soil.